“What is going on in Japan, and who decided on behalf of the world population that it is okay to be using uncontrollable nuclear technology for the sake of profit ? There are recent reports of a proposal to evacuate 40 MILLION people from Japan to mainland China Loren Moret – a nuclear industry whilstleblower – estimated in late 2011 that 145 TRILLION lethal doses of radiation were released from Fukishima into the air and oceans of the world The Fukishima nuclear event is the worst, largest and most dangerous man-made disaster in recorded history I am informed that reactor-grade uranium has a half-life of 700 MILLION years radiation is constantly being released from Fukishima – every second of every day The Japan nuclear disaster is putting the whole planet risk what are our Aussie politician doing about it ? What are world leaders and politicians doing about it ? 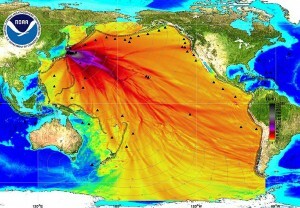 Why didn’t our Aussie politicians tell the Australian public that Fukishima radiation was detected in Australia within 6 weeks of the nuclear disaster?? Amazing how little press this disaster has received, if we continue to treat our planet with such disregard soon it won’t support us any longer. Our air, our water and food will be toxic what then?